In the market for the best shower filter? 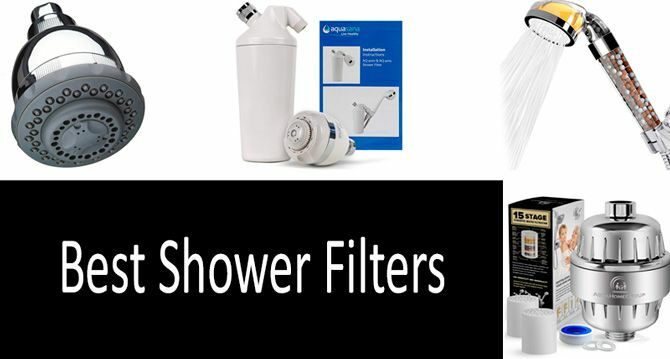 You’re in luck because, in this buyer’s guide, we’ll cover all types of shower filters available for purchase, filtration benefits, and limitations, things you’d want to look for when shopping, as well as review the TOP 5 Best Shower Filters on the market! Hop on and read a fantastic guide we’ve put up for you to make choosing a shower filter less of a hassle. What is a shower filter and how it works? When my child was just a few months old, we noticed that every time he took a bath, his atopic dermatitis would just flare after being in contact with water. I, then subsequently learned, that hot water would make the symptoms worse. But it was not just the temperature of the water that affected his skin condition, but also the quality of water in the shower. Our pediatrician would then ask us to purchase a shower filter immediately and keep the temperature down to 97 F. And while we mostly battled atopic dermatitis with a series of high-quality emollients after bathing, I’m pretty confident that having a shower filter helped us greatly. In this guide, we’ll learn why it’s important to filter water in the shower and how you can benefit from it, even if you do not suffer from any specific medical condition. A shower filter is a type of filter that can be attached or fitted directly into the showerhead or installed after the shower arm to help filter the impurities of water, remove chlorine, odors, and even alter the pH of the water to make it softer. But why would you want to have a shower filter in the first place? We are going to address this question and many others further on in this article. 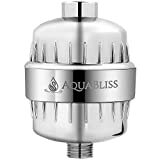 AQUABLISS is revolutionizing the shower filter industry with a REVOLUTIONARY, PROPRIETARY SYSTEM that BALANCES the four elements you need to block Chlorine, bacteria, pesticides, and inhibits the growth of scale, algae, fungi, mold plus restores what your hard, chemical filled water did to your hair, skin and nails! To understand how you can benefit from a shower filter, let’s see why water in the shower is just as important as a tap water you drink. While chlorine plays a key part in disinfecting disease-causing organisms, it’s also harmful to human health, contributing to such fatal conditions, as cardiovascular disease, cancer, diabetes, as well as increase chances of premature aging. For example, a study published in the American Journal of Epidemiology found that there was an increased risk of bladder cancer associated with exposure to disinfectants commonly found in drinking water, the risk was even higher for exposures through showering and bathing. The reason behind this is pretty simple: while there’s a liver to detox the water that we drink, there’s no such detox organ for the human skin. Besides, skin being the largest human organ without its own “filtration system” is at a greater risk of exposure to pollutants and contaminants. Another important factor to consider is that shower water releases chemicals into the air that you breathe. According to the environmental engineers from the The University of Texas, tap and shower water contain “trace amounts of harmful chemicals such as radon, constituents of gasoline, or by-products of drinking water chlorination”, which are then released into the air contributing to an indoor pollution. This information is critical if you suffer from allergies or asthma because these chemicals can worsen your condition or increase adverse allergic symptoms. As mentioned at the beginning of the article, the hard water can contribute to exacerbation of any skin condition, like atopic dermatitis, eczema, psoriasis, etc. And although hard water is considered a better alternative to soft water, it might still be necessary to soften your shower water in case you have a very sensitive skin or any particular skin condition. Perfluoroalkyl substances (PFAS) which include perfluorooctanoic acid (PFOA) and perfluorooctanesulfonic acid (PFOS) are considered chemicals that can be also found in trace amounts in water, and while these numbers are generally low and insignificant, it’s still better to avoid an exposure to them. Especially, considering that if a mother of an unborn child is exposed to PFAS, the chemicals can reach the baby through an umbilical cord. If you think, your area is exposed to PFAS (you’re living near a manufacturing facility, military or civilian airfield), it’s generally recommended to use a bottled water, shower filters, and take shorter baths. Now, if you have not been yet convinced that it’s important to have a shower filter, we’ve outlined a few benefits below for you to finally make that long thought decision. There’s been an ample number of scientific studies that linked excessive exposure to chlorine with asthma. And while these studies mainly concerned exposure to chlorine and its byproducts in pools, it’s safe to assume that these findings can be extended to an exposure in household environments. Also, as mentioned earlier, having a shower filter or water softener can help atopic children in their battles with dry skin. The thing is, hard water, while beneficial for healthy people, can be detrimental to those who suffer from skin conditions. Atopic children are known to have a skin barrier defect which can be further exacerbated by exposure to hard water because it increases the skin surface pH and makes the skin more susceptible to irritation. There was an article in Daily Mail published way back in 2008 with a screaming headline that drinking or showering in tap water could increase the birth defects. 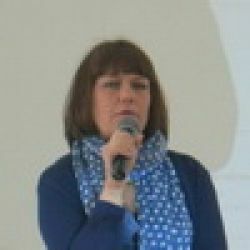 And while the study on which the article was based had been later proved to have significant limitations, it’s still necessary to say that chlorine should be avoided when pregnant. Thus, it’s advised to use a shower and faucet filters, even if you’re only trying to get pregnant. As mentioned earlier, chlorine, its byproducts, and other toxic chemicals that are seldom found in water contribute to health problems, were linked to certain types of cancer, and cardiovascular diseases. Thus, having a shower filter will reduce your exposure to those chemicals and contribute to your overall wellbeing. Although not concerning the use of shower filters in common households, there was a study that addressed the use of filters for hospital water systems. Surprisingly enough, the installation of filters proved to be highly effective in eliminating serious pathogens like Legionella and Fusarium from the showering water. The contaminants that filters eliminate depend on the size of the holes of the filter screen, the smaller the holes, the more contaminants the filter can remove. Some of the other harmful chemicals, pathogens, and bacteria the shower filter can remove include: Giardia and Cryptosporidium, arsenic, disinfection byproducts, lead, pesticides, and radon. Some contaminants, like disinfection byproducts, including chlorine, can easily turn into vapor and be inhaled, causing headaches, fatigue, and even depression. Water is essential to the skin's overall health and resilience, pure and clean water is even more so. Anti-aging treatments can easily be replaced by proper hydration and drinking ample amount of clean decontaminated water. Also, a nice cold shower can be more beneficial than hot baths not only because it prevents chemicals from activating and vaporizing into the air, but also because it provides a soothing and rejuvenating experience for the skin. According to skincare expert Cecilia Wong, extra hot showers are particularly detrimental to human skin because the hot water can damage epidermis and even superficial tissues, all of which can result in broken capillaries, rashes, itchiness, dryness, irritation. People suffering from acne will definitely benefit from having a lukewarm (as opposed to hot) shower through a bacteria-killing shower filter. Hair loss prevention, perhaps, is the least obvious benefit of having a shower filter, but the most propitious and promising. First off, as with the epidermis, the showering water must be lukewarm, to prevent the damage to the cuticles. Besides, cold or lukewarm water constricts the cuticles making the hair look glossy. Chlorinated water, in turn, make the water look frizzy, lifeless, brittle, and unhealthy. Since water makes ¼ of the hair weight, it’s important to drink plenty of clean water to ensure the hair is well-hydrated. Also, taking lukewarm filtered showers would ensure your hair is lubricated with crystal clean and mineral-rich water, stimulating the hair growth. There are definitely a few things to look out for in a shower filter to ensure it would live up to its promises. First off, it’s the type of filtration. The different type of filters are discussed further below in the article, here, though, we’ll just mention that it’s advisable to look for multiple-stage filtration to ensure the water would be crystal clean when coming out. All of the filters alone would have their own limitation in terms of the number of impurities they are able to eliminate, so having a few of them would be ideal. The durability and longevity is another factor to consider. Usually, the filters have to be changed on a regular basis, some once in six months, others once in a month or three months. For me, having to change a filter once in a month would be a deal breaker, first off, because, I would most probably forget to do that, and secondly, it is the cost associated with purchasing and replacing filters. And that brings us to another factor to watch out for. Whenever you’re looking for a shower filter, see when, where, and how you’d have to change the filters. Can you use any universal filter for replacement? Do you have to purchase a specific filter manufactured by the seller? What are the costs associated with buying and replacing a filter? All of these questions need to be asked before you commit to the purchase. Manufacturer’s repute is important because you don’t want to get stuck with a no-guarantee filter, or not being able to talk to a live person and find out ways to install the filter, change, replace, or return it. Shower filters must meet certain EPA standards and have to be certified by NFS, which is a Public Health and Safety Organisation. If the filter complies with the NFS standards, it means the filter has undergone and passed strictest scrutinies and procedures imposed by the organization. Not all of the products listed in our TOP 5 are certified by the NFS, although most of them are and some are in the process of acquiring the required papers. It might be also worth looking into the water pressure which might be affected by the installation of a shower filter. Generally, these issues can be resolved by reinstalling the filter correctly, but some of them specifically decrease the pressure to save water or to make the filtration thorough. In any case, if you’re concerned with these factors, it might be worth looking into reviews of a particular filter, call the manufacturer or look for cues in the product description. Spray mists might be beneficial for facial cleansing, showering kids, and generally for a more gentle bathing experience. However, not all potent shower filter heads would come with this functionality. See how many spray settings the shower has if that’s what you’re looking for. There are several types of shower filters available on the market and it’s important to discern their limitations to understand which one would be right for you and your family. Carbon shower filters are the most used and common types of filters used in the household. These filters use chemical adsorption of an activated carbon to remove impurities from water. KDF Filters are relatively new water filtration devices based on copper-zinc formulation. When zinc and copper are pressed against each other they will generate an electric charge, which is used to remove chlorine, mercury, lead, hydrogen sulfide, as well as some bacteria and fungi. Two-stage filters are exactly the type of filters we suggested a little earlier while describing limitations of copper-zinc filtration. Two-stage filtration implies the use of KDF technology as the first step of cleaning water from impurities like chemicals and chlorine and activated carbon as the second step to remove additional contaminants. Everyone heard about the benefits of Vitamin C, thanks to the most famous pioneer of megavitamin therapy, Linus Pauling. But despite its obvious benefits in treating the common cold, Vitamin C filters, like this one from AquaHomeGroup, were proved to eliminate chloramines, sediment, and chloride from water. The main disadvantage of these types of filters is their expensiveness. Now, it’s time to look at some of the TOP models currently available on the market for purchase. We’ll cover KDF-55, carbon, multiple-stage filters, both certified and in the process of obtaining certifications, so you’ll have ample amount of options to choose from. This item is an absolute bestseller that features multi-stage filtration system blending KDF-55 with calcium sulfate and activated carbon filtering. This 3-stage filtration system enables maximum performance in both cold and hot water, as well as guarantees removal of sediment, dust, turpitudes, chlorine, heavy metals, trihalomethanes, organic materials, and other impurities. It might be slightly more expensive than the previously described shower head, but it’s totally worth it. It also just as easily can be installed with no additional tools or help. Customers were super pleased praising the filter for performance and the quality of water it provided, many said it was a life changer. The unhappy consumers, although very few, said it reduced water pressure significantly, which might be an issue with the incorrect installation. So in case you purchase AquaBliss and experience something similar, then reach out to the company’s customer service, they are very quick to reply and also very helpful, no questions asked, according to testers. This is an amazing wall-mounted filtered shower head that meets all EPA and NSF certification requirements and features a patented filter media bacteriostatic, which means it limits the inflow and growth of bacteria inside the shower head. The item is pretty easy to set up and install: the manufacturer provides a Teflon tape, which should be wrapped around an existing shower arm, and used to attach the shower head. What makes this shower head stand out is the massage options that it provides, there are actually five different spray settings from full body-spray to an invigorating pulse for deeply soothing muscle massage. The filtration reduces the harsh chlorine levels and the amount of hard residue created by minerals in water thus, making it softer. The filter belongs to KDF class, which are not very effective at eliminating certain types of bacteria and organic compounds, but are good for everyday use and would certainly work great for eliminating chlorine and odors, associated with it. The filter is good for about 6 months, after which has to be replaced with a certified filter. Customers have been happy with the performance of the shower head, with many testers saying they saw a big difference and overall improvement in their skin and hair conditions. Others who were not impressed complained of the weight of the shower head, saying it was rather huge and should be handled with care around children. Some testers said they saw no difference in the hardness of their water and advised on purchasing a real water softener (if this is is what you’re looking for). This is a water filter that features 15-stage filtration system, including Vitamin C ceramic balls, granulated activated coconut carbon filter, KDF-55, calcium sulfate, among other filters, which promise to remove every possible impurity from your water. Among those interesting and potentially powerful filters that manufacturer lists in the product description are the mainfan stone which claims to restore pH balance of the skin, ceramic balls with ions, which help in staph prevention and growth of other harmful bacteria. Besides, all of those potent filters are encased in ultra-fine and high-density steel mesh on both sides, which serves as an additional layer of protection against impurities. The filter falls within the same price category as other filters described above, only you’re getting 2 filter cartridges for the price. That might seem like a very fine deal but unfortunately, there’s not enough consumer response to determine the filter’s true effectiveness. To date, the majority of respondents said they were impressed with the filter, but the responses were posted around the same time and thus, raised suspicions. I hope my suspicions are ungrounded and baseless, but until proven otherwise, this product seems too good to be true. This is yet another bestselling item from a reputable company with an impeccable reputation. And although it falls more on the pricier side, it can be safely recommended as a cost-effective option or best value for money. It’s been EPA & NSF certified meaning it passed all certified tests and has been approved for both effectiveness and safety. The filter features a two-stage filter system that incorporates both coconut shell carbon and KDF-55 copper-zinc mix. The potent multi-stage filtration enables the unit to be effective against such impurities as chlorine, lead, other heavy metals, hydrogen sulfide, pesticides, herbicides, VOCs. Just as any other item on our list, this one too requires a change of filters once in 6 months. The reviews concerning the water quality after installing those filters were very positive. The negative reviews were almost always concerned with the high prices associated with installing and replacing filters (however, as one customer put it, the item was so easy to install, “it practically installed itself”, so do not pay for others to install it for you, it’s easy and can be done by anyone). This is a beautiful shower addition from PureAction that looks very “designish” and “techie” and would marvelously fit into both minimalist and baroque bathroom aesthetics. The shower head filters feature multiple stage filtration with Vitamin C, a universal mineral blend of tourmaline, calcium sulfite, and negative ion balls. These stages are promised to remove chlorine, fluoride, chloramine, bacteria, pesticides, ammonia smell, sulfur, and sediments, all of which, as the seller claims, would make the water much softer. The item’s also easy to install and comes in a luxurious gift box with a 60-inch shower hose, replacement cartridge filters, sealant tape, and 3 aroma filters. The majority of reviews was very recent, meaning the product had just seen a light of day, but these comments were also very positive, so the product does inspire optimism. It’s priced very affordably, so hopefully, it lives up to its promises. What is a KDF shower filter? KDF filter, as explained earlier in the article, is a special type of filter that’s based on zinc and copper mix, where impurities are removed by electron exchange, also known as a redox reaction. Can you clean a shower filter and reuse it? Theoretically speaking, you can do this, but it’s practically not possible to clean out all impurities and contaminants within the filter, so when you reuse it, it will be at least ineffective, at most dangerous. How often should I change a shower filter? Please, follow the manufacturer’s instructions, which specify the schedule for replacement. Usually, it’s every 6 months. How to change shower filter DIY? Usually, you’ll have to remove the showerhead cap, and once separated, take out the used shower filter and replace it with a new one. It’s important to place the new cartridge the same way the old one was installed. Then reassemble the shower head. What’s the difference between shower filters and regular water filters? Which is one is best? The main difference is in how and what different types of filters clean. For example, the tap water filter might not clean certain heavy metals, because they are harmless when digested. But these same impurities have to be cleaned by shower filter because when they come in contact with a soap and later with human skin, they become detrimental to the epidermis or hair, or both. Having covered all major players on the market for the best shower head filters, we’re confident you’ll make the right decision and purchase the optimal model for your bathroom. All options covered above can be recommended without compunction. If you’re a stickler for detail and care much about certifications, then choose the one approved by the EPA and NFS. If you don’t care about those things and just want for your shower to work and do its job as it’s supposed to, then choose the most affordable option on our list, because all models reviewed are pretty good and live up to their expectations. I m looking for also good shower filter. Informations provided by You are very helpful for anyone. Thank u so much. In Dubai, easily available in online are these two brand: PureBlue and Blu Ionic, prices are almost same. Also Aquasana. Can you help me which one will be best? I m confused a lot.